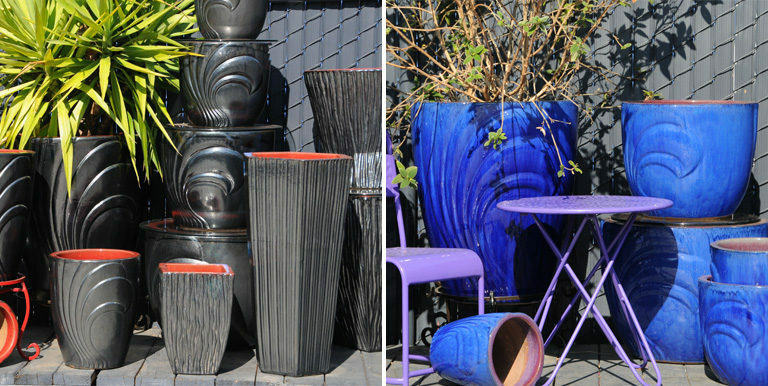 Indochine offers a vast collection of items to enhance your garden…not just in summer, but all year. 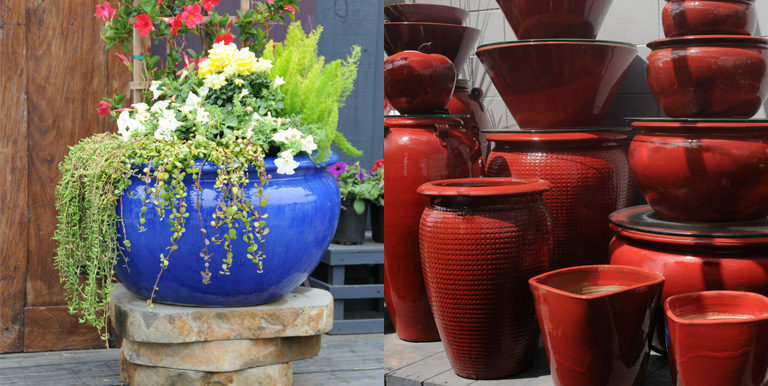 Our frostproof garden pottery comes in many styles, colors and sizes to offer year-round color and plantings. A very dramatic accent in the garden! We also have ceramic saucers for under the pots and a variety of stands to lift them off the ground. To light your garden paths we offer several styles of stone and ceramic lanterns, all are drilled for electrical wiring. One of our more unique styles is created in Java from granite river rock, each large flattened oval shape stands on end with large slits cut into the rock to let the light escape. They are approximately 20″ tall. These are truly wonderful! Granite millstones from China make an unusual solution to stepping sones along a garden path. These old stones were rescued from old animal-driven grain mills. Each hand carved piece is unique and average 18″-24″ in diameter and from 4″-8″ in depth. And let’s not forget the birds! We have a variety of birdbaths for these feathered creatures. And a delightful assortment of whimsical creatures in wood, stone and ceramic to tuck into the garden to keep you smiling. Our beautiful and sturdy teak benches from Bali, as well as stone benches, and stone and ceramic stools and small tables make a wonderful sitting area in the garden, porch or patio while enjoying the quiet of the garden. Gaze out at a round, golden ceramic gazing ball, or a monumental Buddha of stone, or any number of other figures in our outdoor, frostproof garden statues collection from Bali. 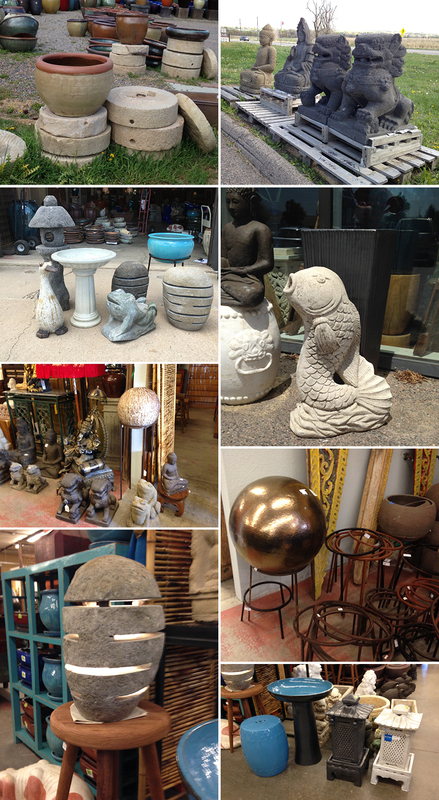 Come see all the possibilities at Indochine. 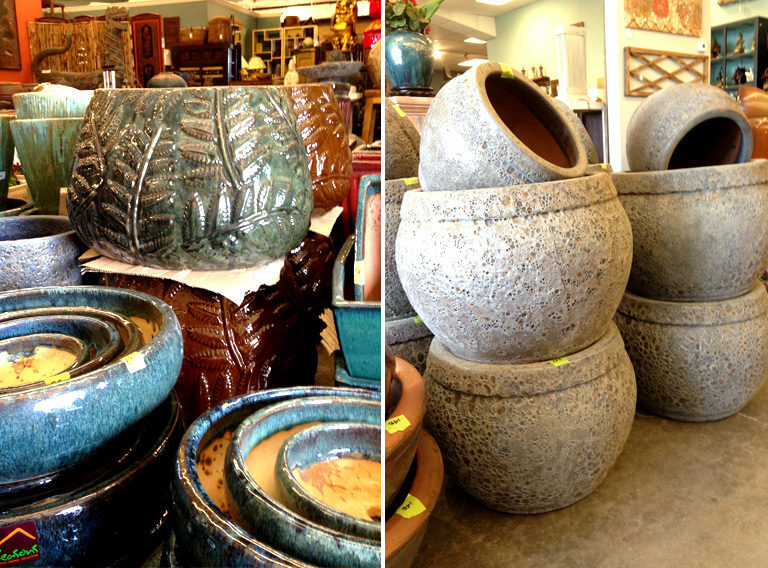 We have a brand-new shipment of frostproof pottery in! Many new styles, sizes, colors, and shapes. 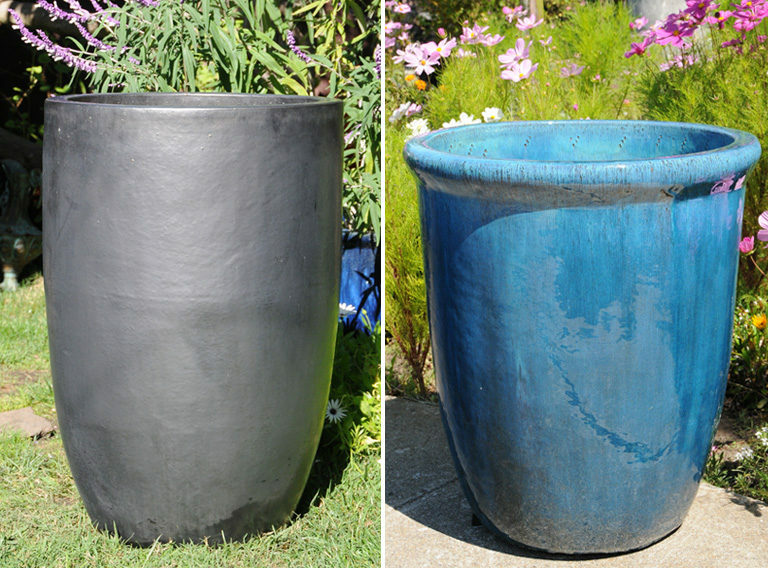 What makes our pots special is the dense material makes them non-porous, and therefore frost-proof. If they have proper drainage, they can be left outside year-round with no damage. They are fired at high temperatures, which allows them to become very hard and durable, and they are easy to clean and care for. Get 20% off our frostproof pottery! PLUS get a free plant with the purchase of any pot! Only through Sunday, May 8th, so hurry in. 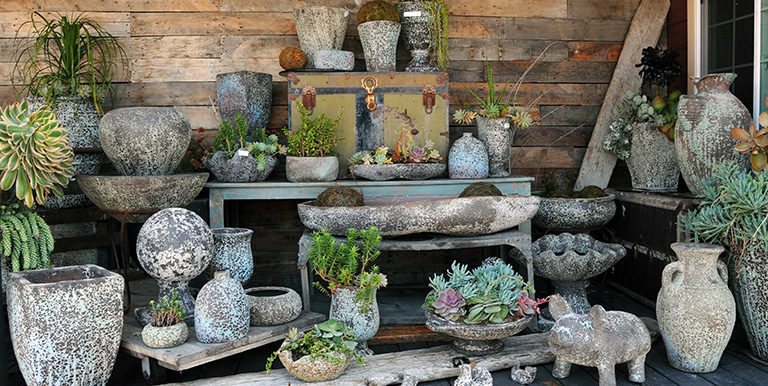 Indochine is the area’s largest importer of contemporary high-quality, high-fired stoneware garden pottery. The dense material makes them non-porous, and therefore frost-proof. We have many styles, colors and sizes. 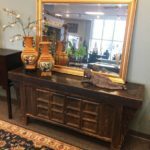 If cared for properly these pieces will last many years and ad beauty to your garden and home. The pots that do not have drilled drainage holes and are glazed on the inside will hold water and can be used as small pools and fish ponds in your garden.